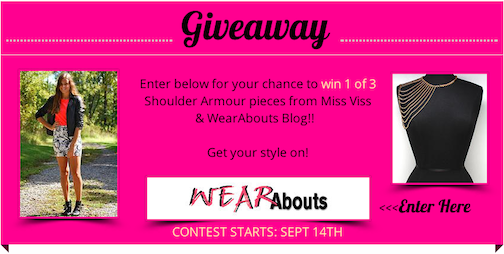 Wear Abouts: Miss Viss Giveaway! A new giveaway for you guys today! It will run for one week and three of you will be winners! The pieces to win are fashionable/wearable pieces called shoulder armour. If you have been keeping up with fashion week, you've seen the trends of harnesses at shows like BCBG. Well, this fits that trend! Get your fashion week on with one of these cute shoulder armour pieces. Great blog, thank you for the giveaway ! This is awesome! Love your blog.